In Madrid, the Evangelist Reinhardt Bonke will be ministering on 12-13 of June. Churches are participating and our team will be involved in personal evangelism and counselling. At the Calvario Church in Torrejon de Ardoz, Madrid we are preparing and involving the members to be mobilized for the Evangelistic Festival we will hold in September to reach out to their community. 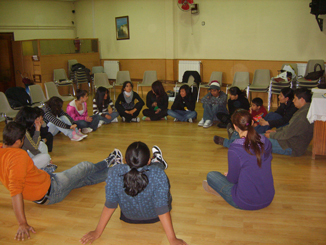 During Rey´s visit to Menorca, the entire church held an inner healing seminar and a revival meeting with Ptrs. John and Shiela, ministers from England, Rey shared with them about the FIRE VISION ministry concept and they were so excited to confirm that the Lord has been leading them to such a ministry and even before we met, they knew the Lord has called them to be part of it. Praise God, they are coming to visit Madrid on 11-14 of June. 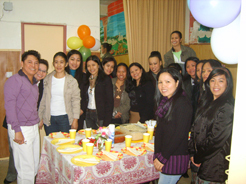 Sis Shiela will conduct a women´s conference and Ptr. John will anoint the Fire Vision Leadership Development Course graduates. 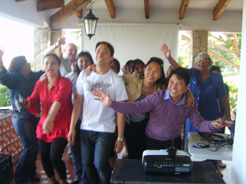 Also, a meeting in Malaga will be held (on June 19-21) to confirm the participation of a couple Tom (English man) & La Vern (Filipina) with some ministers who would be part of the networking associates of the FIRE VISION MINISTRY. Praise God for the answer to prayers, a Dutch family opened their home to host our participants coming from Dallas, USA and some churches opened their church buildings to accommodate the rest. We are always excited every time we prepare for the MOVIDA FESTIVAL because blessings just flow and needs are all met. Indeed, God´s work done in God´s way never ever lack resources! Graduation day for the FIRE VISION LDC Students will be celebrated in two different locations to take advantage of the opportunity to invite friends and loved ones. 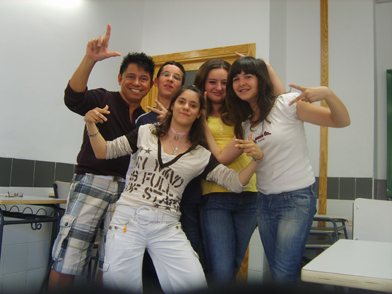 We have 10 students in Las Rozas Church and 18 in Tesoro Church. To go and make disciples as stated in Matthew 28: 19-20 “Therefore go and make disciples of all nations, baptizing them in the name of the Father and of the Son and of the Holy Spirit, and teaching them to obey everything I have commanded you. And surely I am with you always, to the very end of the age." Dani´s arrival will be on June 11 and he already has a line up of speaking engagements and ministry opportunities. The Lord is so good to our son and we are grateful for the way He opened doors for him. As young as he is, he already committed to serve God full time. The Lord honoured our desire and prayers for him. We asked the Lord to use him, our one and only son as God gave His only SON for us, now it´s our turn to take the decision of giving what we have for HIM … for His honour and glory! THANK YOU for your support & prayers. It´s so wonderful to have friends and loved ones like you who despite of life´s challenges your priority is still His Kingdom. He promised, all these will be added unto you as you seek first HIS GLORIOUS, ETERNAL KINGDOM, Amen!